Gov. 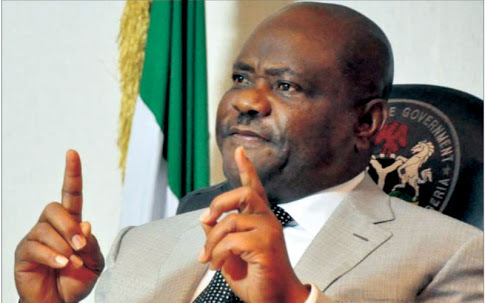 Wike Clash With Army For Stop Neighborhood Watch and Tagging Them "Militia"
The Rivers State Government has accused the Army of disrupting the recruitment of personnel into the State Neighbourhood Safety Corps Agency and advised the army to stay out of politics. The army spokesman claimed that the troops met more than 100 recruits sharpening their military skills at the camp. But they cautioned the military against dabbling into “partisan politics”. Speaking though its Information and Communications Commissioner Emma Okah, the government said the involvement of military in politics could derail the 2019 elections in the Southsouth state. The commissioner described the actions of the army as an insult to the government and people of Rivers State because it was unprovoked and unnecessary. Okah regretted that the Nigeria Army acted wrongly at a time when President Muhammad Buhari has clamoured for community policing methods to support over-stretched conventional security agencies as canvassed by him through Vice President Yemi Osinbajo during the two-day summit on national security organised by the Senate in February. The statement further accused the Federal Government of applying double standards on the issue of neighbourhood security outfits. It said: “On November 13, 2018, Zamfara State Government inaugurated the Civil Joint Task Force who are armed. Their photograph is reported in the front page of The Guardian of November, 14, 2018. “Lagos State has the Lagos State Neighbourhood Safety Corps; Kwara State has Operation Harmony and Kano State has Neighbourhood Watch (Vigilante Group). Other states like Imo, Enugu, Edo etc have security support agencies which are the equivalent of the Rivers State’s Agency. “So, where did Rivers State go wrong? Okah asked. Interestingly, before carrying out the screening exercise, the agency had written to the Nigeria Army and other relevant agencies asking for drill and physical training instructors, security etc but the Army ignored the request and never advised against it but preferred an ambush. “The Rivers State Neighbourhood Safety Corps Agency is a body created by act of parliament to assist security agencies in local intelligence gathering and the Nigeria Police, Department of State Services, Nigeria Security and Civil Defence Corps etc are represented in the board of the agency.